I have a slightly different post to share with you today, and I hope you like it! I'm a sucker for Lush products and there are never less than four bath bombs or bubble bars waiting for me to use at my apartment. I'm obsessed! There is just nothing better than a good bubble bath after a long day, in my opinion. :) So today we're taking a quick look at Lush's Dragon's Egg Bath Bomb! 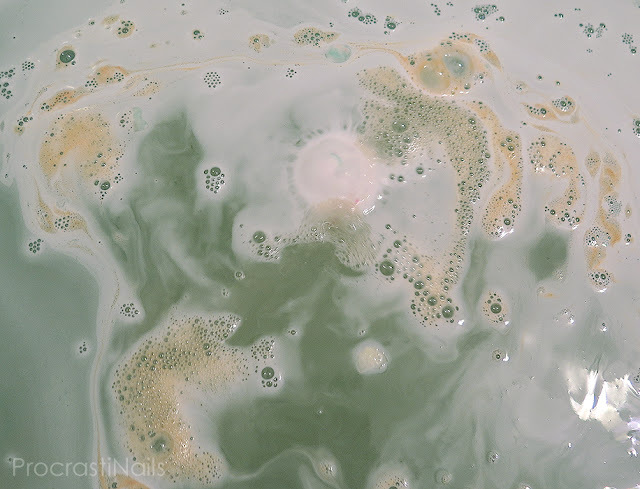 I assume everyone knows what a bath bomb is but just in case you don't I'll let you know that it's a magical ball of goodness that you drop in the bath to release scents and moisturizing oils and fizzyness. :) You put the whole thing in, and I really wouldn't recommend trying to cut it or break it apart unless you want a huge mess on your hands. 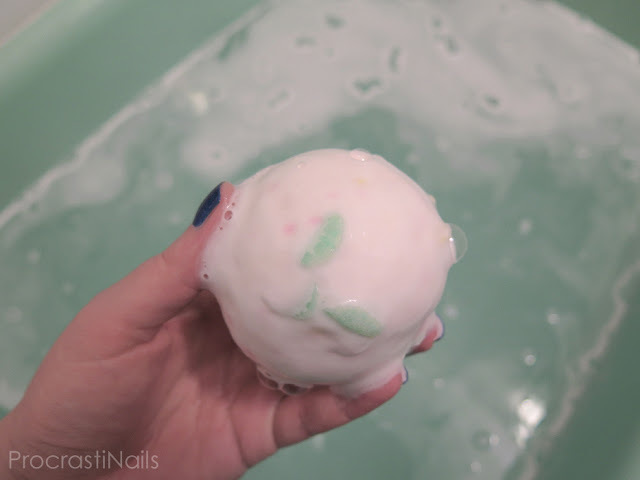 If you're looking for something you can use more than once I'd suggest looking at the bubble bars instead! Okay, so let's get into it! You start with a baseball sized powdery pink ball with some small spots of pink and yellow and some fruit loop-looking larger pieces of green and yellow sticking out here and there. At this point the scent is really subtle, fruity with a hint of floral. And then we drop it in the bath! And that's because there's an orange popping core in the middle! Yes, I said popping. 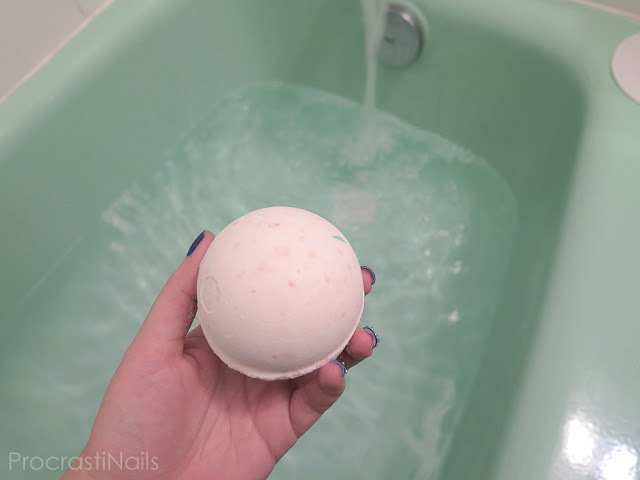 As this bath bomb fizzles away in the tub it eventually starts POPPING! Like actual sounds of fireworks going off under the bathwater! I was so startled! Haha. Look at that bright and vibrant orange goodness! 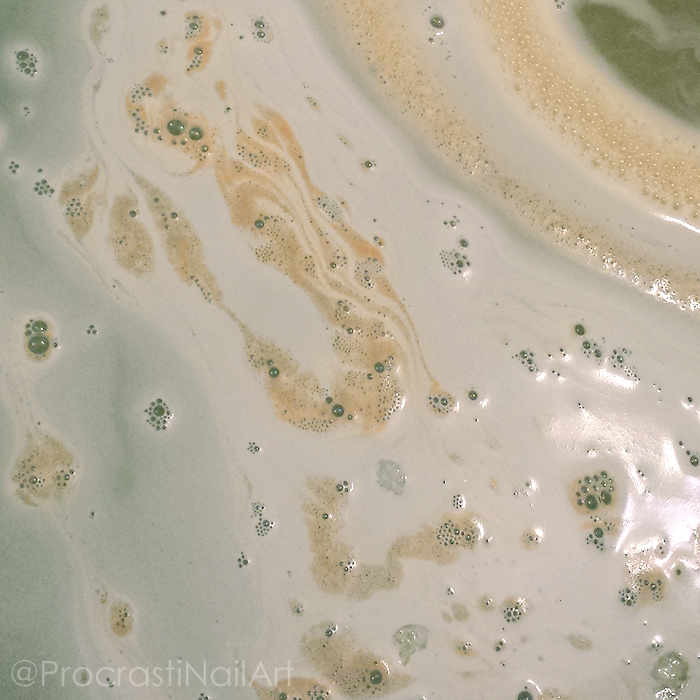 Once it's fully fizzed away in your bath you're left with suds of white and orange with yellow water underneath, and the water is PACKED WITH GOLD GLITTER. The glitter didn't follow on my skin when I got out of the bath, but it did leave a glittery rim on my tub that needed to be rinsed off. Worth it? Worth it! The full scent of this bath bomb is very fruity and floral, as I mentioned earlier. Lush says the scent I'm smelling is a "sherbet-y citrus scent of lemon and bergamot" so let's go with that. So that's it for today! 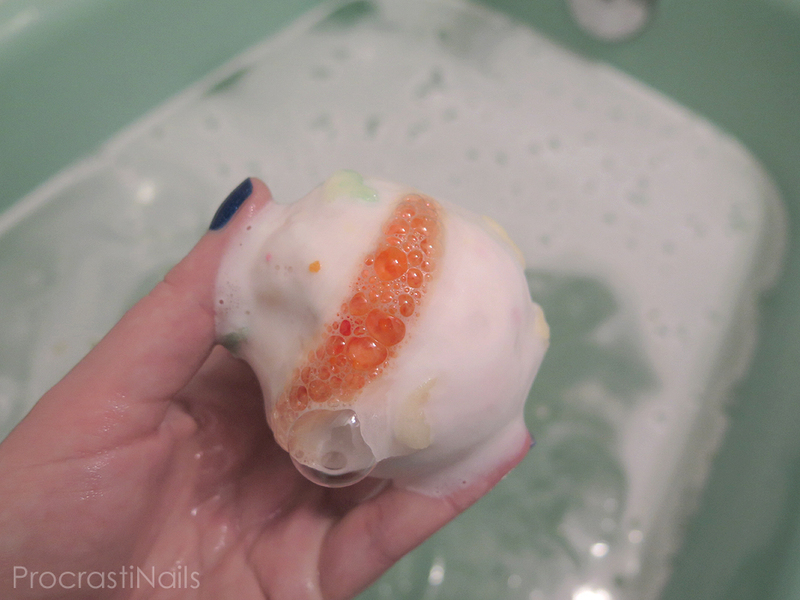 Have you tried the Dragon's Egg Bath Bomb? Are you as obsessed with Lush as I am? Let me know! It looks like a fun bath bomb for your bath.